Even before it opened in theaters, I Feel Pretty faced a backlash. After the trailer dropped, some women voiced frustration over the casting of Amy Schumer in a role that presumes she’s so hideous only a head injury could make her feel beautiful. Those criticisms aren’t invalid: Schumer does partake in the privileges many American women don’t – she’s white, able-bodied, femme, and of average body size. But there are other problems with I Feel Pretty beyond Schumer’s casting. The predictable comedy from writing-directing duo Abby Kohn and Marc Silverstein (Never Been Kissed, He’s Just Not That Into You) attempts to tell a story about body positivity and never pulls it off. Schumer plays Renee, an IT drone at the high-end cosmetics brand Lily LeClaire. Her life isn’t awful, but she’s constantly reminded of her insecurities around her appearance. While shopping, a sales girl informs her they only carry her size online. When she undresses at night, she disapprovingly scans her body in the mirror. And on her first trip to SoulCycle, Renee feels like an outsider surrounded by supermodel-types who gracefully hop onto their bikes as she clumsily smashes into the seat, ripping her pants. I Feel Pretty hits on something relatable when it finds the humor in Renee’s struggle with her body, reflecting the realistic pressures and anxieties produced by a culture that tells women they’re not skinny enough, hot enough, or fit enough. The premise is less of a commentary of Schumer’s specific body or weight, and more about how people of varying body types can experience shame and body dysmorphia. I Feel Pretty uses that entry point for its Shallow Hal-like premise: after wishing that she could be pretty on a stormy night, Renee falls off her SoulCycle bike and wakes up to see the supermodel version of herself staring back at her. Too bad none of it is very funny. Busy Philipps and Aidy Bryant as Renee’s best friends provide the only laugh-out-loud moments, and Michelle Williams is delightful playing a cosmetics executive who acts like Miranda Priestly as a soft-voiced alien. The premise of I Feel Pretty would work better within the quick-hit comedy structure of an Inside Amy Schumer sketch. Stretched across a nearly-two hour runtime, the joke gets old fast. Even with Schumer front and center, her comedic monologuing – a tirade about dating profile pics, a freakout out over how Emily Ratajowski’s organs fit inside her body – play like excerpts from a standup routine we’ve already seen. It just doesn’t translate to, or justify, a feature-length film. I Feel Pretty tries to add an innovative twist to the classic makeover trope – a “normal” woman becomes “beautiful,” only to finally realize that what really matters is what’s on the inside. The problem is, the movie doesn’t spend any time telling us who Renee actually is on the inside, or developing her beyond her superficial desires. The only time we learn what makes Renee so likable is when she enters a bikini contest and lists off her best personality traits – and honestly, I don’t even remember what those are. Kohn and Silverstein depict Renee as a woman defined by her vanity. In a better movie, that could play like a commentary on the toxicity of the beauty industry, and how deeply our insecurities can us consume us. I Feel Pretty isn’t that insightful. The movie also makes Renee ridiculously naive. She’s jealous when a sleazy jerk hits on Ratajkowski’s Mallory, then can’t understand how a woman who looks like Mallory could also get dumped, and she’s flattered when she thinks a construction worker whistles at her. In 2018, as the film industry is still reckoning with the revelations of the #MeToo and Time’s Up movements, a movie where a woman wants to be catcalled and ogled by gross dudes in order to feel validated feels incredibly ill-advised. It’s hardly a spoiler to reveal that by the end, I Feel Pretty follows the predictable path of a woman learning to accept herself, and Renee finds happiness as she is. I didn’t buy it for a second. There’s nothing to support her sudden pivot, mainly because her sense of self-worth is founded on an illusion. 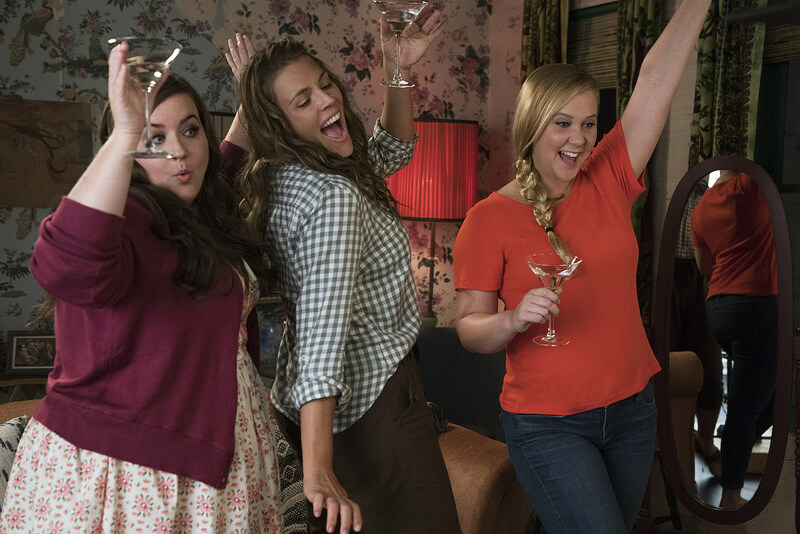 While Kohn and Silverstein’s film has some good intentions, I Feel Pretty is little more than a daft commentary on cultural beauty standards that spends too much time laughing about the outside to ever place value on what’s within.